An employee’s comments on her personal Facebook page about her manager were discriminatory and in violation of the Human Rights Code, the Ontario Human Rights Tribunal has ruled. Oscar Perez-Moreno, a manager at The Cranberry Golf Resort in Collingwood, Ont., filed a human rights complaint against his co-worker, Danielle Kulczychi, due to racist comments posted about Perez-Moreno on Facebook. The comments were posted after Perez-Moreno intervened in an argument Kulczychi was having with another co-worker. In the online posting, Kulchzychi referenced Perez-Moreno’s Mexican heritage in a derogatory manner. Perez-Moreno testified that Kulczychi’s comments were “humiliating and damaging to his character, work and personal life” and “created a negative emotional, social, mental, and possibly financial effect on him.” The negative impact of Kulczychi’s comments was also felt by Perez-Moreno’s son, who was informed of the discriminatory comments by a classmate at school. In rendering a decision, the tribunal confirmed the Ontario Human Rights Code applies to workplace-related postings on the Internet, including comments made by employees on their personal Facebook pages. The tribunal found Kulzychi’s comments amounted to harassment in employment in breach of the code as the comments were “vexatious and related to an incident that occurred in the workplace.” Further, the tribunal also found Kulczychi “knew or ought reasonably to have known her comments were unwelcome to the applicant.” As Perez-Moreno did not seek monetary compensation from the tribunal, but rather that Kulczychi be removed from the workplace — a remedy outside the tribunal’s authority — the tribunal instead ordered Kulczychi to complete the Ontario Human Rights Commission’s online training program, “Human Rights 101” and to provide written conformation to Perez-Moreno upon completion of the program. It is interesting to note Perez-Moreno did not include the employer as a respondent along with Kulczycki. Despite this, employers can be held vicariously liable for the actions of their employees even if they have not directly engaged in the misconduct themselves. Employers should ensure they implement and properly enforce policies and procedures in the workplace, including policies addressing issues of harassment, respect for human rights and proper use of electronic media, both in the workplace and at home, if appropriate. While it may not be possible for employers to monitor the movements of all of their employees through social media, employers should ensure any issues that are brought to the employer’s attention are properly addressed to remedy the rights of the victimized employee. Employees should be aware they have certain protections under human rights legislation. Comments made by co-workers or management both during working hours and outside of the workplace may be discriminatory and in violation of human rights legislation, thereby entitling the employee to various remedies, both financial and also of a more remedial nature that is more in keeping with preserving the public interest. While there are many benefits to the rise of social media, this has created a new area in which the rights of employees, including human rights, can be trampled upon. 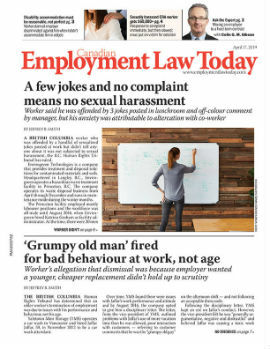 Social media, including Facebook, is within the scope of the Ontario Human Rights Code and Applications can be brought by victimized employees against co-workers as well as employers who have made discriminatory comments through social media. • Perez-Moreno v. Kulczycki, 2013 HRTO 1074 (Ont. Human Rights Trib.). Ronald S. Minken is a senior lawyer and mediator at Minken Employment Lawyers, an employment law boutique, located in Markham, Ont. He can be reached at www.MinkenEmploymentLawyers.ca. Ron gratefully acknowledges Sara Kauder and Kyle Burgis for their assistance in preparation of this article.